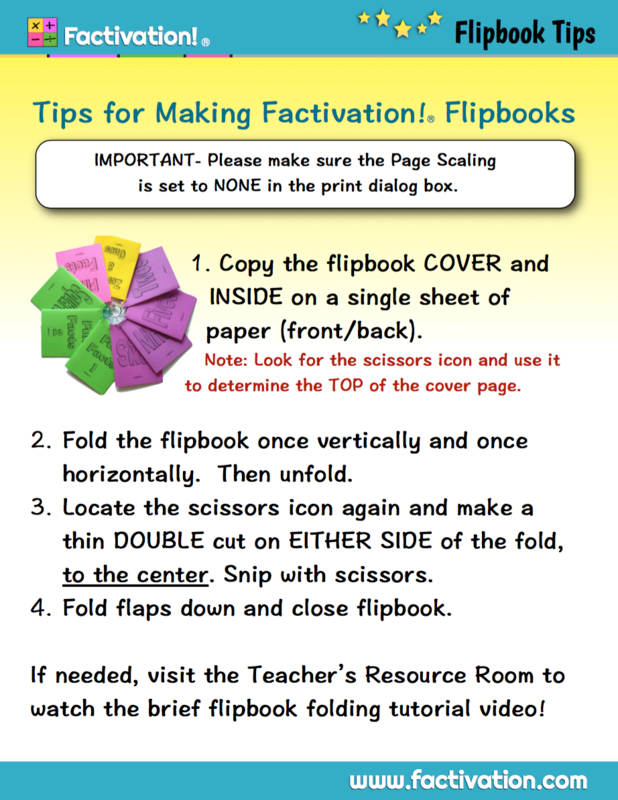 Factivation’s lesson progression uses research-based instructional practices to move students from initial understanding of the concept of Addition to accurate recall through memory-enhancing strategies and purposefully designed accuracy building activities. After accuracy is established, student begin timed, targeted fluency building. This brain-friendly, complete process prepares students to then apply facts, with automaticity, to problem solving scenarios. 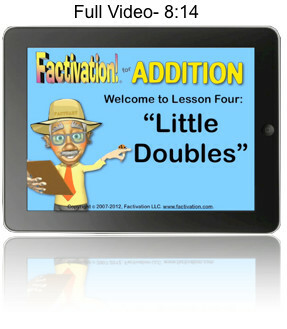 Factivation connects newly acquired facts to their Subtraction counterparts and students gain a thorough understanding of the reciprocity of the operations during the Application portion of the lesson. Before developing fact fluency, it is important that students have an understanding of this important fact: addition is repeated addition. When we have groups and the same number of ‘things’ in each one, we multiply (or add repeatedly) to find the total (product). 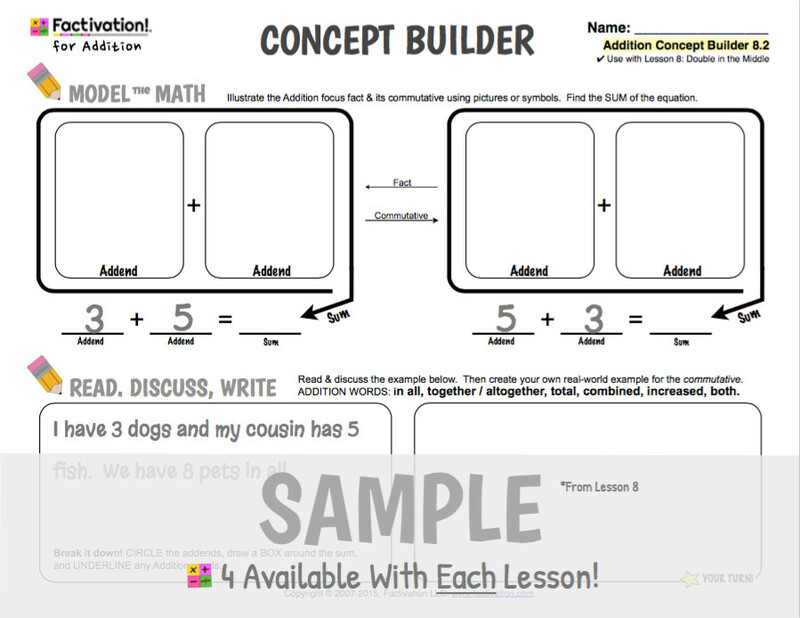 Concept Building is Segment 1 of the Factivation!® Lesson Progression, providing students an opportunity to build a strong foundational understanding while being introduced to the focus facts for this lesson. Lay the foundation for this lesson! Use the Adderpillar™ mat (and any available manipulatives) to give students hands-on experience building “Little Doubles” Addition facts. (For this lesson, have students use only the first two sections of the Adderpillar’s body.) 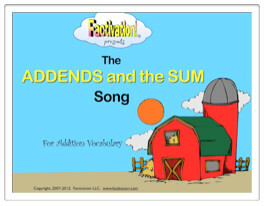 Play the Addition singalongs whenever time allows to reinforce the concept of Addition and Addition vocabulary. PROCEDURE: The first time this activity is introduced, read or watch Eric Carle’s The Very Hungry Caterpillar. Explain to students that they have a very hungry adderpillar™ who likes to eat gummy bears (adapt to fit your manipulatives). Model: Write a Doubles fact on the board: 3 + 3 = ___ for example, and say, “When our adderpillar™ first woke up, he was hungry, so he ate 3 gummy bears. Point to the “3” in your equation and then to the first empty section of the adderpillar’s body. Say, “Our first addend is 3. By mid-morning, he was hungry again and ate 3 more gummy bears.” (Point to the other “3” in the equation and place 3 gummy bears in the second section of the adderpillar™. Say, “Our next addend is also 3.”) Ask, “How many gummy bears did he eat in all? 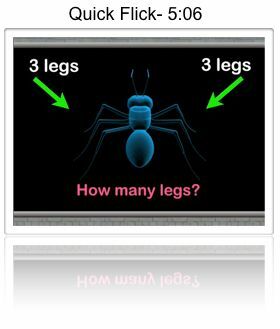 What is the SUM?” Refer back to your equation and ask students to find the sum. Record. Continue modeling with different Doubles facts as needed. 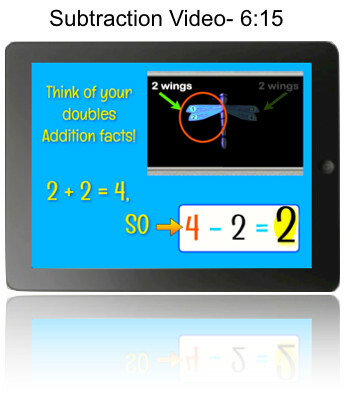 Practice: Have students practice building this lesson’s Doubles facts independently or with a partner using their Adderpillar™ mat and manipulatives. Follow up each fact building session with an Addition Concept Builder. 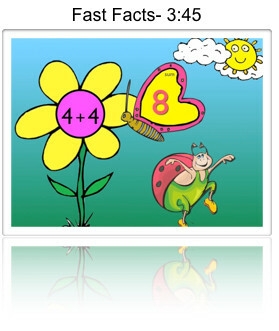 Place the Adderpillar™ mat and manipulatives in a Math center for continued practice. Estimated Duration: 2-3 days | Time/Lesson: 20 mins. Use for a concept lesson, then place in a center for independent practice! Before students can build fact fluency, they need to be consistently accurate in solving Math facts. Accuracy follows conceptual understanding and precedes the development of automaticity, which is why Accuracy Building is Segment 2 of the Factivation!® Lesson Progression. TO ENSURE SUCCESS, show an instructional video daily to familiarize students with new facts/strategies. Assign purposeful follow-up practice using the accompanying Fluency Builder. Do not enforce a strict time limit yet. Allow students the needed time to use the strategies learned. Monitor for consistent, correct (not automatic) recall. 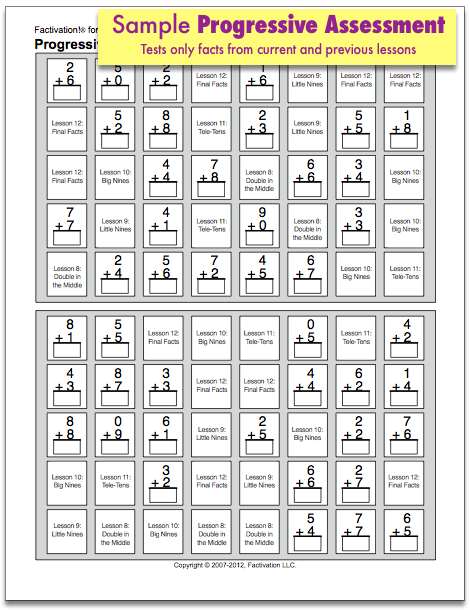 For additional practice throughout the day, engage students in class competitions with the accuracy building Smartboard games. Assess and move onto Fluency Building (Segment 3) when students demonstrate readiness. Great for centers and/or home use! IMPORTANT- Use the assessment above to assess accuracy (not fluency) before moving on! Once students are showing consistent, accurate recall, it’s time to begin fluency building. Students who have developed automaticity (being able to recall answers with ease, automatically) are more successful with Math because, when faced with complex problems, the brain can focus on the more challenging processes rather than having to “work” to recall basic facts. 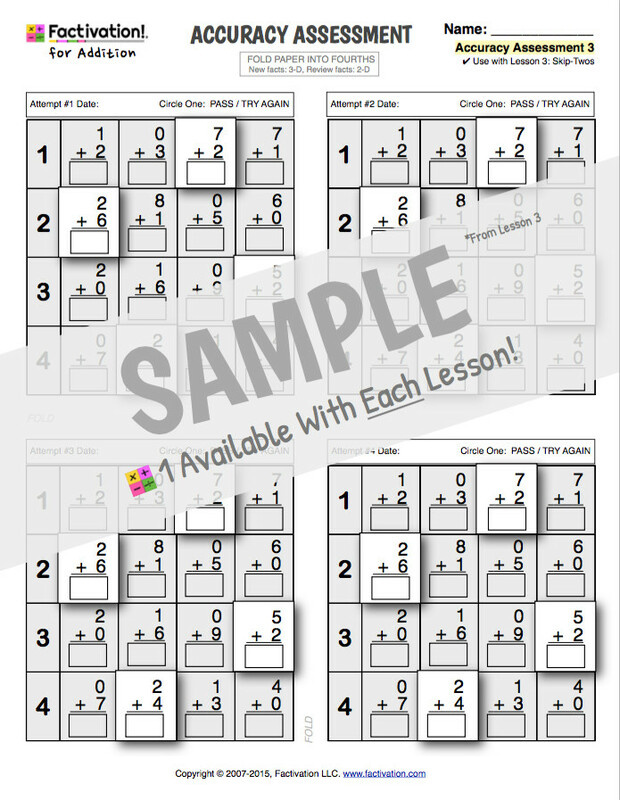 Fluency Building is the crucial third segment of the Factivation!® Lesson Progression. Move from accuracy to automaticity! TO ENSURE SUCCESS, students should already have developed accurate, untimed recall with the lesson’s focus facts (see Segment 2). 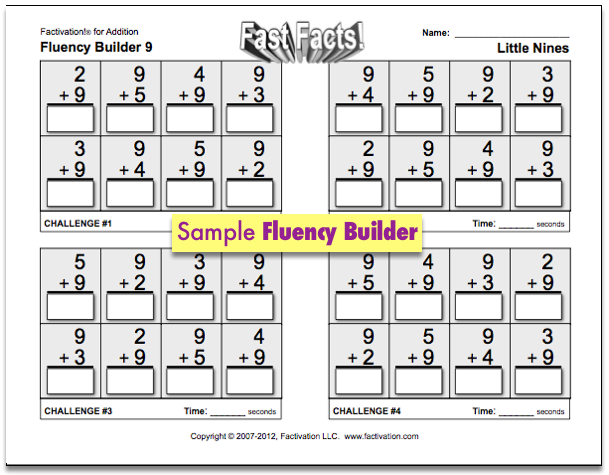 Assign the Fluency Builder activity daily using one of the suggested formats. 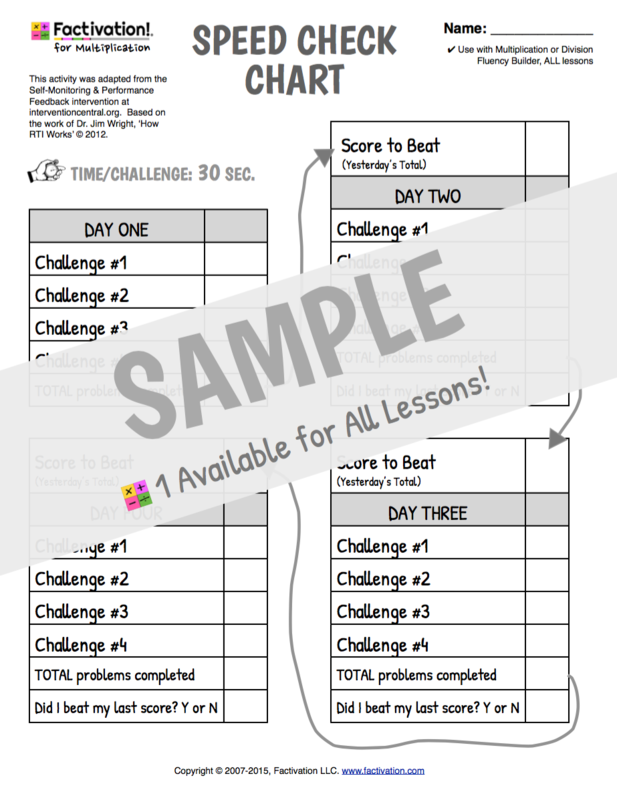 Have students track their own progress using the speed check chart. 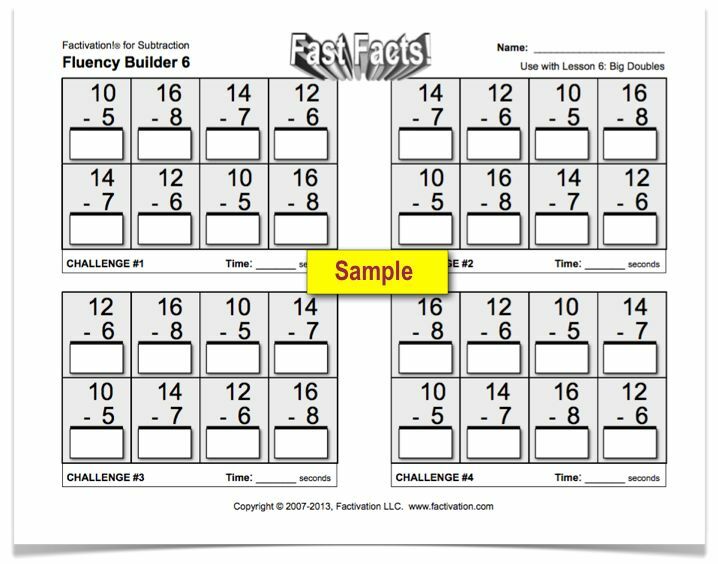 For additional practice throughout the day, show the Fast Facts video or engage students in class competitions with the fluency building games. IMPORTANT- Use an assessment above to assess fluency before moving on to next lesson segment! Once students have become fluent with the lesson’s focus facts, it’s time to put this new knowledge to use and give students opportunities to apply their learning. Application is Segment 4 of the Factivation!® Lesson Progression. 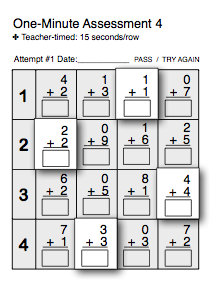 Show the Subtraction video daily to provide repeated exposure to the reciprocity of Addition and Subtraction. Follow up each video lesson with a Logical Links page to give students practice in applying their knowledge of this lesson’s focus facts to their Subtraction counterparts. 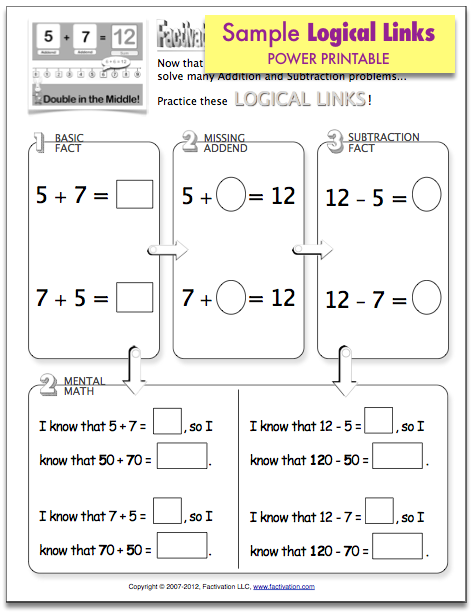 Continue on to fluency-building with the lesson’s Subtraction facts when students demonstrate readiness as per the Logical Links pages (see Subtraction Fluency Builder). 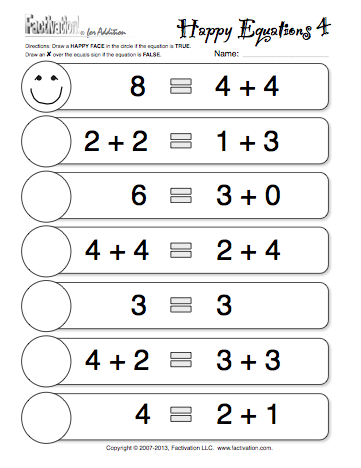 The motivating, research-based Speed Check Chart can be used with the Subtraction fluency builder to track personal progress toward Subtraction fluency goals. Estimated Duration: 3-5 days | Time/Lesson: 20 mins. This printable is coming soon!